The San Diego Business Journal (SDBJ) recently nominated Housing on Merit’s Executive Director, Jennifer Litwak, for the 2018 Business Women of the Year award. 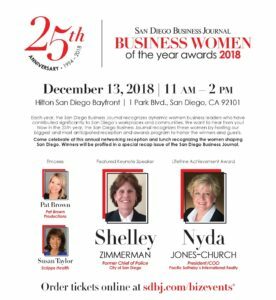 The annual event is SDBJ’s largest annual reception and awards program, honoring successful women business leaders who have made significant impacts in their industries. The event will include a keynote address from the former Chief of Police for the City of San Diego, Shelley Zimmerman, and a Lifetime Achievement Award presentation for Nyda Jones-Church, President and COO of Sotheby’s International Realty. The event will be held at the Hilton San Diego Bayfront on December 13.